The current U.S. economy is headed for its Deepest and Longest Recession since World War II as mounting job losses take their toll on Consumer Confidence, Investment and Spending. Economists are no longer talking about a U.S. recession but a Deep Recession after most of the statistical figures showed business sentiment continued to plummet in early February 2009. “There seems to be a sense of a very deep-seated collapse in the economy,” said Michael Englund, chief economist at Action Economics. What happens when the US Dollars collapses? 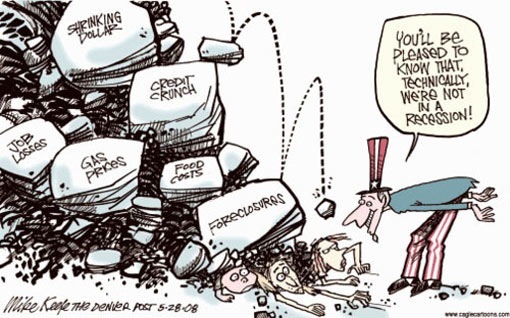 United States have about 13+ trillion dollar consumer debt and literally making trillions of dollars come out of nowhere. Ask anyone they will tell you that Common sense would indicate that the dollar’s going to collapse to nothing. What life’s going to be like if this happen? Do Expected to have more news on Job-loss, Housing, Banking Collapse and meltdown, Energy Crises Converge to Slow Growth and bankruptcy. It is not uncommon to hear More than one Wall Street firm or investment bank has written of tens of billions of dollars in uncollectable debt today. Let Listen to Gerald Celente’s view on it. He’s a world respected trends research analyst and knows what he’s talking about in my opinion. Do you think the US economy will break? When United States sneeze, what countries will get the Worst Flu? Is any there any country that immune from this? How long does this Collapse will End? Are worried about YOUR’s future and the world’s future? This entry was posted on Sunday, March 8th, 2009 at 9:36 pm	and is filed under Investment. You can follow any responses to this entry through the RSS 2.0 feed. Both comments and pings are currently closed. I’ve been involved in taxations for lengthier then I care to admit, both on the individualized side (all my working life-time!!) and from a legal point of view since passing the bar and following tax law. I’ve furnished a lot of advice and righted a lot of wrongs, and I must say that what you’ve put up makes utter sense. Please persist in the good work – the more individuals know the better they’ll be outfitted to handle with the tax man, and that’s what it’s all about. NEW YORK: The Dow industrials could hit 11,000 this week as investors bet the US labour market had a significant turnaround in March, showing the economic recovery is in good shape. The Dow and the S&P 500 stock indexes are at their highest in nearly 18 months and the expected repositioning before Wednesday’s end of the quarter could provide further support. With the Dow closing above 10,850 on Friday, it would need to rise 1.4% – or a tad less than 150 points – to reach 11,000 level. But with benchmark US Treasury yields approaching 4%, investors may prefer the relative safety of US debt instead of continuing to throw money at a stock market that has risen steeply for more than a year. Economists expect data on Friday to show the economy created about 190,000 jobs in March, but stock investors will have to be brave enough to bet on that confirmation ahead of the data, since the market will be closed for the Good Friday holiday. Wednesday’s private-sector jobs data and Thursday’s jobless claims could support those willing to step out on a limb. “Obviously, the jobs number is the most important thing” next week, said Phil Orlando, chief equity market strategist at Federated Investors, in New York. Stocks closed higher for a fourth straight week, around levels not seen since September 2008, as recent uncertainty stemming from fiscal problems in some European countries and the healthcare overhaul receded. A European Union agreement on a safety net for Greece restored investor confidence, but that net could prove small if fiscal burdens bog down other EU members like Portugal, whose debt rating was cut on Wednesday by Fitch. “Clearly, there is the potential for there to be fiscal issues with other countries in Europe, but the Europeans have now set a precedent that they intend to backstop any negative fiscal situations,” said Ken Farsalas, portfolio manager at Oberweis Asset Management in Lisle, Illinois. Sentiment, nonetheless, remains downbeat. A stock market sell-off on Friday following news a South Korean naval ship had sunk suggests risk takers are ready to sell on any troublesome news – and ask questions later. For the week, the Dow Jones industrial average .DJI rose 1%, while the Standard & Poor’s 500 Index .SPX gained 0.6% and the Nasdaq Composite Index .IXIC advanced 0.9%. The yield on the benchmark 10-year US treasury bond brushed 4% in the past week, foreshadowing a possible roadblock for stock bulls. Three government debt auctions last week had “mediocre, at best”results and rising yields “at some point, become an obstacle for equities,” said Quincy Krosby, market strategist at Prudential Financial in Newark, New Jersey. Yielding 4% and with the relative safety of US government debt, Treasuries could entice investor money that would otherwise continue to pump into stocks. And rising yields also lead to higher borrowing costs. “It becomes worrisome with a fragile economy that’s trying to gain traction and momentum,” Krosby said. Investors will have plenty of data points to gauge that momentum in the coming holiday-shortened week. The state of the consumer will be measured by February income and spending data today and March consumer confidence, tomorrow. Personal income is expected to rise 0.1%, mirroring the previous month’s rise, while the Conference Board’s consumer confidence index is seen rising to 50, from 46 in February, according to economists polled by Reuters. WASHINGTON: The European debt crisis is a stark reminder for the United States to tackle its own massive budget deficit, which some fear will remain at trillion-dollar levels for many years to come. President Barack Obama, who inherited the flood of red ink from his predecessor George W. Bush, has promised to urgently ease the deficit. But some analysts believe his administration is not taking the crisis seriously. Just three days ago, Obama and his Treasury chief Timothy Geithner prodded European leaders grappling with a ballooning debt crisis to put their house in order. Then data last Wednesday showed the US government had suffered its 19th consecutive month of red ink in April, the highest ever for that month. “The irony of American officials telling Europeans to tighten their belts was accentuated” by the fresh deficit data, Ed Yardeni, chief investment strategist for Yardeni Research said. The April deficit brought the shortfall for the first seven months of the 2010 fiscal year ending Sept 30 to US$799.68bil. The White House has forecast the 2010 deficit will swell to a new record of US$1.555 trillion due to massive spending to stimulate recovery from the worst recession in decades. As debt contagion fears grip Europe sparked by problems in Greece, analysts warn that the United States has only limited time to forge a credible plan to end its own fiscal woes. “Interestingly, however, the sense of urgency about near-term fiscal tightening, so evident this (last) week in the UK and euro area, is largely missing in the US,” noted Dean Maki, head of Barclays Capital US economic research. Partly this was because investors tend to flock to rather than keep away from US Treasury bonds when risk aversion spiked, he said. The US dollar, which has risen rapidly against the embattled euro amid the European debt crisis, is the premier reserve currency and viewed as a safe haven during financial turmoil. The flight to US Treasuries was also due to a stronger pickup in US economic growth from recession, “which if sustained makes a given level of the deficit-to-GDP ratio easier to finance,” Maki said. “However, we doubt the US can get by indefinitely without serious deficit reduction efforts,” he said. One “interesting test” would come at the year-end, when the Bush-era tax cuts of 2003 were set to expire, raising marginal tax rates across a wide swath of households, Maki said. Obama has established a bipartisan debt commission charged with finding ways to reduce the gaping budget deficit, promising to halve the deficit he took on by the end of his term of office in 2013. WASHINGTON: The number of troubled banks kept growing last quarter even as the industry as a whole had its best quarter in two years. The Federal Deposit Insurance Corp. said Thursday that the number of banks on its confidential “problem” list grew to 775 in the January-March period from 702 in the previous quarter. But banks overall posted net income of US$18 billion. That was up from $5.6 billion in the same quarter a year earlier. “The banking system still has many problems to work through, and we cannot ignore the possibility of more financial market volatility,” FDIC Chairman Sheila Bair acknowledged. The largest banks showed the most improvement. They have mounted a strong recovery with help from federal bailout money and record-low borrowing rates from the Federal Reserve. A majority of institutions posted gains in net income in the first quarter. But many small and midsized banks are likely to suffer distress in the coming years, especially from failed loans for office buildings and development projects. Larger banks are doing better, partly because they are able to cut back on lending in troubled parts of the country such as Florida and Nevada, said Anil Shivdasani, a finance professor at the University of North Carolina at Chapel Hill. “For the most part, smaller and regional banks have less flexibility,” he said. And a further decline in home prices, expected by many analysts, would cause more losses for banks. “Another leg down in housing could extend the period for which the credit distress persists,” said Richard Brown, the FDIC’s top economist. The amount of money that banks set aside to cover future losses dipped nearly 17 percent from a year earlier. Losses taken on loans that banks don’t expect to be repaid were up 38 percent from a year earlier. But those losses were down slightly from the fourth quarter of last year. The FDIC’s deposit insurance fund, which fell into the red last fall, posted its first improvement in two years. Its deficit shrank by $145 million to $20.7 billion. The FDIC expects U.S. bank failures to cost the insurance fund around $100 billion through 2013. The agency mandated last year that banks prepay about $45 billion in premiums, for 2010 through 2012, to help replenish the fund. Agency officials noted that they are getting higher bids and more bidders at auctions for failed banks. Banks have also been able to raise money in recent weeks to strengthen their balance sheets or make acquisitions. Last year, 140 federally insured institutions failed and were shut down by regulators. It was the highest annual number since 1992 during the peak of the savings and loan crisis. Last year’s failures extended a string of collapses that began in 2008, triggered by loan defaults in the financial crisis. The pace of bank collapses this year exceeds last year’s. 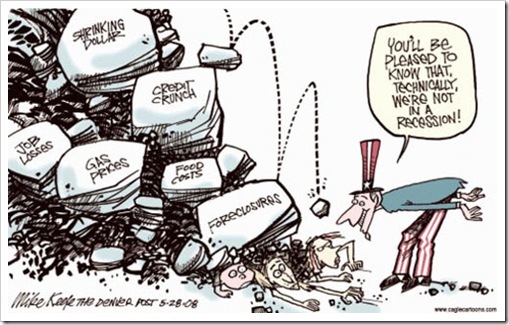 So far, 72 banks have failed in 2010. As a result of those failures and bank mergers, the number of FDIC-insured institutions fell to 7,932 in the first quarter. That’s the first dip below 8,000 in the history of the FDIC, which was created in 1933. However, depositors’ money – insured up to $250,000 per account – isn’t at risk. The FDIC is backed by the government. A change in accounting rules forced banks to bring assets packaged into securities onto their balance sheets. That boosted the value of loans on banks’ books by nearly $249 billion, up nearly 2 percent from the fourth quarter of last year. Without the accounting change, however, loan volume would have declined. Fears that American, British and other governments intend to inflate their way off the rocks of excessive debt prompted record inflows into gold this week. Now some fund managers claim the price could more than double to US$3,000 per ounce within five years. Heavily indebted governments throughout the developed world are struggling to fill deficits of black-hole dimensions in public finances by imposing spending cuts and tax rises. Both are expected in Britain’s emergency Budget on June 22 and neither will be popular. But keeping interest rates lower than inflation and letting the currency take the strain is another way to reduce the real value of debt. You can see why politicians may feel that is the “least worst” option. Stealthily robbing savers by eroding the purchasing power of money is less likely to cause riots in the streets than spending cuts, because inflation tends to hit older people hardest while unemployment hits the young. Governments can devalue their own currencies, but it is harder for them to make more gold. That fact helped prompt record inflows of US$484mil into gold exchange-traded commodities this week, while gold trading volumes peaked at US$2.1bil. However, the precious metal is not a one-way bet and it slipped back below US$1,200 (Â£830) on Thursday as some investors took profits amid anxiety about an unsustainable bubble in the gold price. Graham French, manager of the M&G Global Basics Fund, was undeterred. He said: “In a scenario of rising sovereign risk, where government finances are hugely overstretched and central banks have been systematically devaluing paper money, gold’s value as a safe haven and a stable physical currency can only increase over the medium term. French’s strategy is based on the belief that things that emerging markets sell will fall in price over the next five years, while things that emerging markets buy will rise in price. The explanation is that demand from the heavily indebted developed world may remain subdued, while demand from largely debt-free consumers in emerging markets will rise. Rupert Robinson, chief executive of Schroders Private Bank, said: “Gold is setting record highs in almost every currency, despite headwinds including a strong dollar and monetary tightening in India and China, the main end markets for gold. Today’s economic environment makes gold a must in any client portfolio. “Interest rates are at historically low levels; central banks are bailing out the system; we have seen a huge amount of quantitative easing; currencies being debased and governments around the world are short of money. Nothing goes up in a straight line, indeed there are signs that gold may be becoming over-owned and too fashionable in the short term, but I think that over the long term gold is a good asset to hang on to. It could easily reach US$2,000 per ounce within the next five years,” Robinson said. Richard Davis, of BlackRock’s Natural Resources team, added: “Gold always does well in times of uncertainty, and this week is no exception. Lingering concerns over the Greek bail-out, uncertainty over global economic growth, and an inconclusive election result in Britain have all created nervousness in stock markets, and risk-averse investors are looking to gold as a store of value. The fact that gold bullion is a real asset, which does not depend for its value on any company or government, makes it compelling as a “safe haven” investment. Gold bullion is particularly popular in Asia and the Middle East and investors in these regions have continued to pile money into the asset class. Adrian Ash, of BullionVault.com, said: “Inflation alone is not the driver. It’s real interest rates that matter, because if cash is beating inflation, no one needs gold. Whereas when cash loses value, year after year – and if the major productive alternatives, such as bonds, shares and property, also fail investors as well – then gold really comes into its own. “Cash is being actively devalued – and not just in Britain; the Eurozone crisis is only the latest prime mover. Underlying the decade-long upturn in gold is a repeated attack on the virtue of savings,” Ash said. Gold’s fundamental appeal remains that it is a store of value that is largely immune to government intervention. French observed: “The great Irish dramatist George Bernard Shaw said: ‘You have to choose between trusting the natural stability of gold or the natural stability and intelligence of members of the government. And with due respect to these gentlemen, I advise you, as long as the capitalist system lasts, to vote for gold.’ I have to say, I’m with Bernard Shaw on this. WASHINGTON: Federal Reserve Chairman Ben Bernanke says he is hopeful the economy will gain traction and not fall back into a “double dip” recession. That’s because economic growth won’t be robust enough to quickly drive down the unemployment rate, now at 9.7 percent, he says in remarks to the Woodrow Wilson International Center for Scholars, a nonpartisan research group. The economy grew at a 3 percent pace in the first quarter of this year. That’s good growth during normal times. But coming out of such a deep recession, the economy must grow much more strongly to make a dent in the jobless rate. WASHINGTON: The European debt crisis is likely to have only a “modest” impact on the U.S. economic recovery as long as Wall Street stabilizes, Federal Reserve Chairman Ben Bernanke told Congress on Wednesday. Testifying before the House Budget Committee, Bernanke struck a more confident tone that the recovery will remain intact despite problems in Europe as well stubbornly high unemployment and a fragile housing market here at home. “The economy … appears to be on track to continue to expand through this year and next,” Bernanke said. However, the pace of the expansion – 3.5 percent this year by the Fed’s estimate – won’t be strong enough to quickly bring relief to the 15 million Americans who are unemployed. The unemployment rate now at 9.7 percent would likely see only a “slow reduction,” Bernanke warned. Fears have grown in recent weeks that the recovery could be derailed. One worry is if Europe’s debt crisis turns into a broader financial contagion, crimping lending in the United States and around the globe. The situation has spooked investors, sending Wall Street into periodic nosedives. Another worry is that hiring in the United States by private companies could stall. That fear was stoked by a government report last Friday, showing that job creation at private companies in May slowed sharply, with businesses adding only 41,000 new jobs, the fewest since the start of the year. However, Bernanke said signals suggest that the economy will keep on plodding ahead as massive government stimulus fades. Consumers and businesses have picked up the baton from the government and are spending sufficiently to keep the recovery on track, he said. Still, spending by consumers is much more subdued than in the early stages of past economic recoveries. That’s why economic growth is expected to be only modest this year, rather than blistering. “It appears … that the recovery has made an important transition,” Bernanke told lawmakers. Discussing the European crisis, Bernanke also struck a confident tone that the United States would get through the fallout without much damage. “If markets continue to stabilize, then the effects of the crisis on economic growth in the United States seem likely to be modest,” Bernanke said. Stock portfolios are taking a hit from a rattled Wall Street and weaker economic prospects in Europe probably will sap demand for U.S. exports. Although such negative forces “will leave some imprint on the U.S. economy,” Bernanke said there are other more positive forces that will help out the United States. They include low mortgage rates as investors flock to the safety of U.S. Treasurys, and lower prices for oil and other globally traded commodities, Bernanke said. The Fed has pledged to hold rates at record lows to nurture the recovery. Many economists believe the Fed will hold rates near zero when it meets next on June 22-23. And, economists viewed Bernanke’s remarks on Wednesday as bolstering their beliefs that the Fed won’t start to boost rates until next year – or possibly 2012- given the European crisis and high unemployment. “We will take the actions necessary to ensure stability and continued economic recovery,” Bernanke said. Bernanke said European leaders are showing a firm resolve to fight the crisis and restore confidence in financial markets. The Fed will remain “highly attentive” to developments abroad and their potential impact on the U.S. economy, Bernanke said. On another topic, Bernanke said the Fed and other regulators intend in the next few weeks to tell banks to take steps to make sure their pay practices aren’t spurring excessive risk-taking by executives and other employees. A Fed review found that many banks have not modified their compensation practices in the wake of the 2008 financial crisis, Bernanke said. One of the problems that contributed to the crisis was compensation practices that emboldened reckless behavior. The Fed chief also urged Congress and the White House to come up with a plan to whittle down record federal budget deficits. Failing to do so could hurt the economy in the long run, Bernanke said. That’s because it can lead to higher interest rates for Americans to buy homes, cars and other things, and make it more expensive for Uncle Sam to service its debt payments. At some point, “things will come apart,” he warned. “We should be planning now” for a deficit-reduction blueprint, Bernanke said, adding that Europe’s debt problem is a sobering reminder of the need for countries to get their fiscal houses in order. But he added that radical reductions in spending or big hikes in taxes right now wouldn’t be prudent because the U.S. recovery is fragile. And, “more assistance” may be needed, he said. Bernanke didn’t provide details, although Congress is moving closer to extending unemployment benefits. The nation’s red ink hit a record $1.4 trillion last year. The recession took a big bite out of tax revenues, while spending rose to stimulate the economy and provide relief to struggling Americans. For the first time since the beginning of the recession, economic growth – modest and fragile, but growth nonetheless – has spread to every corner of the U.S.
A survey released Wednesday found economic activity was improving across all 12 regions of the nation tracked by the Federal Reserve. It was the first clean sweep in the report since 2007. Metal producers in Chicago and St. Louis cranked out more steel. Makers of drugs and medical equipment in the Northeast did better business. And sales of summer clothes were strong in fashion-conscious New York. Still, the pace of growth in most parts of the country was described as modest. That’s a sign that companies probably won’t starting hiring again anytime soon in great enough numbers to bring down the unemployment rate. “It’s kind of like having more people sign up to run in the Boston Marathon but no one is running very fast,” said Brian Bethune, economist at IHS Global Insight. The central bank’s 12 regional arms have their people fan out to gather information from businesses and talk to local economists and experts on the markets. The result is a much more intimate look at the overall economy than broad statistics provide. Commercial real estate, on the other hand, was weak. And while shoppers spent more freely, they stayed focused on the necessities, not big-ticket buys. The Fed report backed up other recent signs that the job market is slowly improving. More people quit their jobs in the past three months than were laid off – a sharp reversal after 15 straight months in which layoffs exceeded voluntary departures. Some of the quitters are leaving for new jobs, while others have no firm offers, but their newfound confidence about landing work is a good sign for the economy. “The hangover is kind of over,” said David Adams, vice president of training at Adecco, a national staffing agency. The last Beige Book report showed economic conditions improving in every part of the U.S. but one, the Fed’s St. Louis region. The new report has the heartland area joining the rest of the country, helped by strong metal production. The survey will figure into the deliberations when Bernanke and his colleagues meet later this month. They are expected to leave interest rates near record lows to keep encouraging the fragile recovery. WYOMING: US Federal Reserve chairman Ben Bernanke said on Friday the economic recovery has weakened more than expected and the Fed stands ready to act if needed to spur slowing growth. He downplayed concerns that the economy might slip back into recession, predicting a modest expansion in the second half of this year, with the pace picking up in 2011. If that forecast proved overly optimistic, however, he said the Fed had sufficient ammunition left and could support growth by purchasing more government debt or by promising to keep rates exceptionally low for a longer period than currently priced in by financial markets. “The committee is prepared to provide additional monetary accommodation through unconventional measures if it proves necessary, especially if the outlook were to deteriorate significantly,” Bernanke told a Fed conference in Jackson Hole, Wyoming. Bernanke’s comments, in an address to an annual conference of global central bankers hosted by the Fed, came as the government reported the economic growth rate in the second quarter was weaker than it had originally estimated. Bernanke made clear that the US central bank had not decided what would prompt additional easing. “At this juncture, the committee has not agreed on specific criteria or triggers for further action,” he said. While Bernanke focused on near-term issues in the US economy, the head of the European Central Bank, Jean-Claude Trichet, addressed long-term global challenges. He urged governments and central banks to ensure that the transition from very high debt levels incurred in response to the global financial crisis and its economic fallout took place in an orderly fashion and without compromising economic growth. “The primary macro-economic challenge for the next 10 years is to ensure that they do not turn into another ‘lost decade,’” Trichet said. He avoided any direct references to current monetary policy ahead of this week’s meeting of the ECB. In Japan, which has experienced decades-long stagnant growth, the Bank of Japan was examining holding an emergency meeting early this week to ease monetary policy as the strong yen threatens the country’s fragile economic recovery, a source familiar with the matter said. An emergency meeting may be held as early as tomorrow, when BOJ governor Masaaki Shirakawa is back in Tokyo after his return from the Fed conference in Wyoming. Bernanke said the US central bank’s purchases of longer-term securities had been effective in lowering borrowing costs and that he believed the benefits of buying more such assets, if needed, would outweigh any disadvantages. He said other options to spur economic growth – such as committing to hold interest rates exceptionally low for an even longer period than is currently priced in to financial markets, or raising the Fed’s inflation targets – would be less effective in the current environment. Bernanke stressed that the high jobless rate remained a concern to policy makers, and said the Fed would be vigilant against deflation – a dangerous downward spiral in prices that chills economic growth by making both businesses and consumers reluctant to make purchases – even though it was not currently a risk in the United States. “Because a further significant weakening in the economic outlook would likely be associated with further disinflation, in the current environment there is little or no potential conflict between the goals of supporting growth and employment and of maintaining price stability,” he said. Investors and economists said Bernanke’s remarks indicated that he favoured more quantitative easing measures. Despite the rather sober tone of much of his remarks, which were unusually policy-heavy for a conference that tends to focus on loftier academic matters, Bernanke said he was confident the US recovery would not stall. NEW YORK: The fear that has been hanging over markets for most of August lifted on Wednesday. For how long remains anyone’s guess. The stock market started September with a jolt, turning sharply higher after a pair of encouraging reports on manufacturing sent investors seeking out riskier investments. Prices for the safest assets — Treasurys, gold and the dollar — all fell. With investors suddenly willing to embrace risk, the Dow Jones industrial average added 255 points, its best day since July 7. All 30 stocks in the Dow closed higher. That marked a sharp break from August, when the market’s most widely used index turned in its worst performance for the month in nine years. Reports of stronger-than-expected manufacturing growth in China and the U.S snapped a run of discouraging data on the economy, including dismal readings on home sales and economic output. The Institute for Supply Management said manufacturing activity in the U.S. rose in August, in contrast to regional reports from recent weeks that pointed to a slowdown. “It gives us hope that things may not be as bad as they seem,” said Zahid Siddique, an associate portfolio manager at Gabelli Equity Trust Inc. The Dow gained 254.75 points, or 2.5, percent to close at 10,269.47. Industrial stocks such as General Electric Co. and Caterpillar Inc. were among the Dow’s biggest gainers. Analysts cautioned that the gains, like many others the market has seen in recent weeks, could quickly pass. A bad surprise from the Labor Department’s monthly report on employment, due out Friday, could investors back into hiding. The good news on manufacturing “gives some comfort, but that is only good until the next number,” said Darell Krasnoff, managing director at Bel Air Investment Advisors. Even with its gains Wednesday, the Dow is still 989 points below its high this year of 11,258 reached on April 26. Nearly half of those losses, or 451 points, came in August as the market was bombarded with bad news on the economy. Daniel Penrod, senior industry analyst at the California Credit Union League, said manufacturing reports have become increasingly important because they are a leading indicator for whether companies might start adding new jobs. Broader indexes also had large gains. The Standard & Poor’s 500 index rose 30.96, or 3 percent, to 1,080.29. The Nasdaq gained 62.81, or 3 percent, to 2,176.84. About six stocks rose for every one that fell on the New York Stock Exchange, where volume came to 1.2 billion shares. Safety assets fell broadly. Gold slipped $2.20 to settle at $1,248.10 an ounce. The yield on the 10-year Treasury note, which moves opposite its price, fell to 2.58 percent from 2.47 percent late Tuesday. The yield on government debt anchors borrowing rates for a wide variety of consumer and business loans. In corporate news, Burger King Holdings Inc. jumped $2.41, or 14.7 percent, to $18.86 on reports it could be taken private. Apple Inc. shares rose $7.23, or 3 percent, to $250.33 after CEO Steve Jobs announced a new line of iPods. GE rose 53 cents, or 3.7 percent, to $15.01. Eaton Corp. climbed $5.38, or 7.7 percent, to $74.86. WASHINGTON: The outlook for the US economy would have to deteriorate “appreciably” to spur fresh support from the Federal Reserve, minutes of the central bank’s last policy meeting released on Tuesday said. “The committee would need to consider steps it could take to provide additional policy stimulus if the outlook were to weaken appreciably further,” according to the minutes of the Fed’s Aug 10 meeting. The minutes reflected an unusually wide range of views at the Fed for the outlook for the recovery and for inflation and for how the central bank should manage monetary policy. At the meeting, officials agreed to reinvest maturing mortgage-related securities in longer-term US government debt to hold the Fed’s balance steady at about US$2 trillion and keep in place supports for the stumbling economic recovery. While the minutes showed the current preference was to buy Treasury debt, officials left the door open to other options. “While reinvesting in Treasury securities was seen as preferable given current market conditions, reinvesting in MBS (mortgage-backed securities) might become desirable if conditions were to change,” the minutes said. The Fed stopped buying MBS and mortgage-agency debt at the end of March after it had accumulated about US$1.4 trillion worth. It also bought US$300bil in longer-term Treasury securities as part of a programme to spur recovery. The buying spree came after the US central bank had chopped benchmark borrowing costs to near zero in December 2008, leading policymakers to cast about for additional ways to stimulate the economy. In financial markets, US Treasury debt prices held gains as the minutes underscored investors’ concerns the recovery is faltering. The comments weighed on stocks, which turned negative, because they suggested the economy would have to worsen considerably before the Fed undertook more quantitative easing, an analyst said. The minutes were laced with expressions of concern that the US recovery might be losing momentum even as overseas economies were proving more resilient than expected after sovereign shocks earlier this year. “Most saw the incoming data as indicating that the economy was operating farther below its potential than they had thought, that the pace of recovery had slowed in recent months, and that growth would be more modest during the second half of 2010 than they had anticipated,” the minutes said. However, some of the 17 officials on the Federal Open Market Committee said recent data, while weak, were consistent with their forecasts. Others said it was too soon to conclude the outlook for growth had clearly softened. Policymakers were similarly divided on the outlook for inflation. Many said underlying inflation would be below preferred levels for some time, and a number judged that the risk of further disinflation had increased, although the minutes said the risk of a potentially crippling deflation were small. A few said keeping interests rates at an exceptionally low level might be creating conditions for a future price surge. The vote at the end of meeting was 91, with Kansas City Federal Reserve Bank president Thomas Hoenig dissenting. Hoenig said the Fed’s pledge to hold rates exceptionally low for an extended period would prevent the Fed from being able to tighten financial conditions quickly if the economy bounces back. Fed chairman Ben Bernanke said at an annual Fed conference in Wyoming on Friday that the central bank had tools it could deploy to stimulate the economy if it stumbled, and that those tools could be effective. While Bernanke said officials opted to reinvest in Treasuries, in part, because they preferred a portfolio made up mostly of government securities, the Fed would consider other options if conditions warranted. WASHINGTON: Pending sales of previously owned US homes rebounded unexpectedly in July and new claims for jobless benefits fell last week, helping quell fears the economy could face a double-dip recession. The data released on Thursday, including sturdy sales from US retailers last month, followed a report on Wednesday showing a surprising gain in manufacturing and suggested the economy retained some underlying strength. “This is an economy that has hit a soft patch. It’s not an economy that appears to be heading towards a doubledip recession,” said Brian Levitt, an economist at OppenheimerFunds in New York. Investors appeared to agree that fears of a double-dip recession might have been overdone as they sold US government debt for a second straight day and bought stocks. The broad Standard & Poor’s 500 Index ended up 0.91%. TORONTO: There is still a 40% chance of a double-dip recession in the US, and the slide back into recession may come within 12 months, according to US economist Nouriel Roubini. “My view is that the odds are around 40%,” he told reporters, noting that the outlook for the US economy had “materially weakened” since the start of the year. “If a double dip does occur, (it) could occur within the next 12 months,” said Roubini, who is a professor at New York University’s Stern School of Business. Roubini also said Canada would not be able to decouple itself from a US recession completely because of its dependence on exports. Roubini’s comments came on a day when the Bank of Canada raised its key interest rate by 25 basis points for a third straight time this year, bringing the rate to 1%, but cautioned that a weak US economy would hamper Canada’s recovery. Canada’s central bank is the first in the Group of Seven to raise borrowing costs after the global financial crisis. How bad is the double dip? SOME readers feel that I have been too philosophical and big picture oriented. I am trying to understand the long-term institutional and political economy forces that are shaping today’s markets. Are we now in the cyclical phase or are we facing structural issues in the global economy? Let’s take a 30,000 feet view of what is happening globally. The US recovery is now very uncertain as the stimulative effects of fiscal policy are wearing off. Europe is now in a fiscal retrenchment phase. Japanese growth is weak and even China’s growth seems to be peaking. Only the emerging markets’ growth seems to be rebounding strongly, but they are normally lagging indicators (somewhere about 6 months behind). The normally staid BIS Annual Report published in June talks about the phasing of crisis from emergency room to intensive care. Well, is the patient recovering or heading back to emergency care? Paul Krugman thinks that the US Government should be taking more fiscal action. Fed chairman Ben Bernanke is already signalling about “ usual uncertainty”. Is the “double dip” real? No one is sure which way the US economy is heading. There is general agreement that this is a jobless recovery. The decline in the US dollar is helping growth – half of the growth in GDP in the last year was due to growth in US exports. But job losses are still rising, with the unemployment rate hovering around 10%, translating into higher labour productivity. Therefore, corporate profits have risen. The US corporate sector remains pretty strong, although its net worth is still declining. This is mainly due to the fact that real estate value of commercial property owned by the corporate sector is still declining, whilst corporate debt is still growing. What is truly worrisome is the huge fiscal overhang over the advanced economies. The latest BIS reports suggest that fiscal debt of US and Europe would be on average 40% higher in 2011 than 2007 levels. This is only sustainable if interest rates remain near zero. If interest rates rise due to higher inflation, the fiscal debt would explode and the dollar and euro would rise, thus pushing growth down further. In other words, having already overspent in the last three decades, the West has allowed the growth in financial sector leverage to be nationalised after the crisis, thus shifting the losses from the private sector to the state. The heavily indebted state is no longer an engine of growth, whilst the rich in the West remains largely untaxed. This creates a huge political economy question. The middle class feels that it is bearing the brunt of the adjustment, not the rich. The poor is shielded from the pain by the large welfare programmes that are costly and not sustainable. This is why there is huge risk that protectionism will increase, but that will only worsen the deflation. I am not totally pessimistic, but the outlook is worrisome. The first reason is that emerging markets are still too small relative to the global economy. The Chinese plus Indian economies are US$7 trillion in size, compared with US$37 trillion for the US plus Europe plus Japan. So even though these two economies are growing at 8%, they cannot pull the juggernauts that are slowing to 2% growth. The second reason is that the interest rate level is totally distorted relative to the current state of excessive sovereign debt. Textbook economics say that during a crisis, the real interest rate must rise to balance risk with return. Current nominal interest rates still do not reflect the true risks, because of massive “quantitative easing”. Both the monetarist and Keynesian economists have totally misread the whole situation. By allowing excessively low interest rates, the monetarists helped to create the credit bubble. Then when the crisis hit, instead of allowing market interest rates to rise, they lowered interest rate to ease the pain, but transferred the pain to the public sector. At this point, the Keynesians stepped in and pump primed the economy, but spent the ammunition mostly in propping up the financial sector rather than fixing the real economy. They forgot that the crisis was a confluence of cyclical and structural forces. It is cyclical because the global economy cannot have prosperity for too long. It is structural, because the Western consumption was funded by over-leverage and under-investment in infrastructure that under-pinned long-term growth. There is one statistic that illustrates this quandary in Western economic diagnosis of what should be done. Most Western commentators say that Chinese banks over-extended themselves by lending to finance infrastructure through the Local Government Financing Vehicles. One analyst actually called this exposure China’s subprime crisis and recommended shorting Chinese listed bank stocks. Another US commentator laments the fact that whilst the US legislature is still debating clean energy, China spent US$11.5bil on clean-energy technology versus only US$4.9bil in the second quarter of 2010.
Who is financing the Chinese long-term spending on clean technology? Obviously, quite a lot is funded by the Chinese banks that are also funding the spending on the infrastructure to prepare China for growing urbanisation. So, in the short term, these projects may not yield quick returns and there are short-term non-performing risks, but the long-run return to society could be quite large. We should not fear short-term pain, as long as there is long-term gain. If you manage your own portfolio on a quarter-to-quarter, no pain basis, are we surprised that over the long-term your portfolio will suffer? You cannot manage the national and global economies as if they are speedboats. Have a long-term view and stick to it. ● Tan Sri Andrew Sheng is adjunct professor at Universiti Malaya, Kuala Lumpur, and Tsinghua University, Beijing. He has served in key positions at Bank Negara, the Hong Kong Monetary Authority and the Hong Kong Securities and Futures Commission, and is currently a member of Malaysia’s National Economic Advisory Council. He is the author of the book “From Asian to Global Financial Crisis”. NEW YORK: Stocks extended their September rally into a fourth week Monday as investors hoped for more moves by the Federal Reserve to prop up the U.S. economy. Buying accelerated after the Standard & Poor’s 500 index, the market measure most often used by professional traders, broke through the high end of its recent range. Technical analysts see that as a bullish sign for the market. The Dow Jones industrial average jumped 146 points to its highest close since May. Buyers were also encouraged by an announcement from a group of economists declaring that the most recent recession ended in June 2009. The Fed meets Tuesday to discuss interest rates, and investors are hoping for a sign that the central bank might make more moves to keep rates low. There is a growing expectation that the Fed’s rate-setting committee could relaunch programs to buy Treasurys and mortgage bonds in an effort to stimulate the economy. At the very least, it might hint at future plans. “The Fed will hint at it, put it on the table, but not do anything,” predicted Brian Gendreau, a market strategist at Financial Network Investment Corp.
A number of economic indicators have topped forecasts in recent weeks, propelling stocks higher, but the economy is far from strong. If the Fed starts buying bonds again it could drive interest rates lower, enabling companies and consumers to get cheaper loans. The Fed had a similar bond-buying program in place earlier this year. In corporate news, IBM Corp. said it would buy data storage provider Netezza Corp. for about $1.7 billion in cash. Investors see acquisitions as a sign companies are more comfortable spending their spare cash built up during the recession to expand their businesses. The Dow Jones industrial average rose 145.77 points, or 1.4 percent, to close at 10,753.62. The Standard & Poor’s 500 index rose 17.12, or 1.5 percent, to 1,142.71. The Nasdaq composite rose 40.22, or 1.7 percent, to 2,355.83. The S&P 500 climbed solidly above the key technical level of 1,131, the high end of its recent trading range. The S&P briefly crossed that barrier on Friday for the first time since June 21, but not for long enough to convince analysts that the market had enough momentum to surge higher. Many automatic buy and sell orders are set around market milestones such as these, and investors watch those levels closely for clues about which way the market may go next. Five stocks rose for every one that fell on the New York Stock Exchange, where volume came to 955 million shares. Investors have been encouraged by better economic reports this month, especially on jobs and manufacturing, to send stocks steadily higher in September. The Dow is up 7.4 percent in the month to date, the S&P 8.9 percent. The gains have defied predictions that September would follow a historical pattern of being dismal for stocks. Investors also see hope in a softer stance in recent weeks by President Barack Obama’s administration about tax and business-related programs. Keith Goddard, co-manager of the Capital Advisors Growth Fund, said a shift in policy could mean the Bush-era tax cuts will be extended. That would help dividend-paying stocks, which have been in “no man’s land” recently because investors are uncertain the tax rate they’ll have to pay on the dividends, Goddard said. Extending the tax cuts and announcing other policies like a payroll tax holiday could be “worth a 10 percent move in the stock market,” Goddard said. Deal news sent IBM shares up $1.60, or 1.2 percent, to $131.79. Its acquisition target, Netezza, rose $3.67, or 14.9 percent, to $28.27. Bond prices barely budged as investors await word Tuesday from the Fed. The yield on the benchmark 10-year Treasury note, which moves opposite its price, fell to 2.71 percent from 2.74 percent late Friday. WASHINGTON: The Federal Reserve, meeting for the last time before an election that hinges on the weak economy, edged closer Tuesday to jumping in to help and suggested it’s more worried about prices falling than rising. The central bank gathered as new figures showed some improvement in home construction. But those same figures showed the pace of building would have to double to contribute much to job growth, underscoring the dire state of the housing market. The Fed announced no new steps. It signaled that for now it will stand back and see whether the economy can heal on its own. But a change in its policy language, which is examined with precision by the financial world, showed it was moving closer to acting. The Fed said it was “prepared to provide additional accommodation,” where before it said it would “employ its tools as necessary.” It also concluded that economic growth had slowed over the summer. That’s all too clear to the nearly 15 million Americans out of work, some of whom scoffed at news earlier this week that the recession had technically ended in June of last year. Voters will go to the polls Nov. 2 for midterm elections, and polls have suggested two things: They’re worried about the economy more than any other issue. And they’re ready to punish Democrats. President Barack Obama’s Democrats are at risk of losing control of the House and perhaps the Senate as well. Both parties agree there’s little the president and his party can do to change voters’ attitudes before the election. The central bank’s statement Tuesday didn’t explicitly mention deflation. But it said inflation measures are “somewhat below” what’s desirable for the economy. Some economists have raised fears about a deflationary spiral — a widespread drop in wages, prices of goods and services and the value of stocks and homes. “They are more worried about the economy and deflation than I thought they would be,” Sung Won Sohn, an economist at the Martin Smith School of Business at California State University, said of Fed officials. Bond prices jumped after the Fed news as traders surmised that the Fed might eventually buy more Treasury bonds to try to drive down long-term rates. The yield on the 10-year Treasury note sank to 2.58 percent from 2.70 percent the day before. Stocks rallied briefly on the news but ended mainly lower. Home construction rose last month and applications for building permits also grew, the government said Tuesday. But the building of homes and apartments is still running at an annual pace of just 598,000, a far cry from the robust housing-market activity it takes to generate many jobs. If the economy keeps losing momentum, the Fed will be likelier to act when it meets again, either at its meeting Nov. 2-3 or its last regularly scheduled session of the year on Dec. 14. If the Fed does act, Chairman Ben Bernanke last month indicated a preference to buy large amounts of government debt — a move to lower rates on mortgages, corporate loans and other debt and get people and businesses to spend more money. Unconventional steps like that, known in economic circles as “quantitative easing,” have helped the Fed’s balance sheet balloon to $2.3 trillion, nearly triple its level before the financial crisis. Even if the Fed made such a move, economists don’t think it would help much. Already low interest rates haven’t managed to get Americans to spend much more. Companies and people alike have remained cautious as they rebuild their finances and pare debt. At its last meeting in August, the Fed took a small step: It decided to use proceeds from its huge mortgage portfolio and buy government debt. That nudged down mortgage rates. But it would take a bigger buying binge to push rates down further. NEW YORK: Stocks got a brief bump following word that the Federal Reserve is ready to do more to help the U.S. economy, but ended mostly lower Tuesday after the central bank disappointed some investors by not taking any bold new actions. Treasury prices rallied as investors saw the Fed’s announcement as a signal that more bond purchases were on the way. The Fed said it is concerned that inflation is below levels consistent with a healthy economy and indicated that it is ready to provide “additional accommodation” to support the recovery. That would mean more purchases of Treasurys or other kinds of debt, which would keep interest rates low and hopefully encourage borrowing. Treasurys rose sharply after the Fed’s announcement, sending interest rates lower. The yield on the 10-year Treasury note fell sharply to 2.58 percent from 2.70 percent the day before, while its price jumped $1.03 to $100.34. The yield is a common benchmark for setting interest rates on corporate debt and mortgages. The impact of the Fed’s statement, which came after a one-day meeting of its interest rate committee, had only a temporary effect on stocks. Hopes had been building that Tuesday would bring news of a specific new bond-purchasing program, and disappointment ensued when one didn’t materialize. Stocks had been trading lower ahead of the Fed’s announcement and rallied briefly after the news came out. A late slump erased most of the day’s advance from broad market indicators, while the Dow Jones industrial average, which tracks 30 large companies, ended with a meager gain. The Dow rose 7.41, or 0.1 percent, to close at 10,761.03. It’s still up 7.5 percent for September, an unsually large gain for a month that is historically weak for stocks. The Standard & Poor’s 500 index slipped 2.93, or 0.3 percent, to 1,139.78, while the Nasdaq composite fell 6.48, also 0.3 percent, to 2,349.35. Falling stocks outnumbered rising ones two to one on the New York Stock Exchange, where volume came to 1 billion shares. The weakness in broader indexes suggested that a three-week rally on the stock market may be losing steam as stocks start to seem expensive. The S&P 500 is still up 8.6 percent for the month, an extraordinarily strong showing for the month, while the Nasdaq is up even more, at 11.1 percent. Tom Porcelli, head of U.S. market economics at the Royal Bank of Canada, said there’s now a good chance the Fed will decide to add more debt to its books at the next meeting of its rate-setting committee on Nov. 2. But another round of bond buying by the Fed may offer the economy little help, he argued. The last round of Fed purchases had the effect of lowering lending rates by a half a percentage point. Now, a move by the Fed would have probably less of an impact. Borrowing rates are cheap but borrowing is still weak. “The fact remains that the economic backdrop is the driver of lending not low rates,” Porcelli said in a note to clients after the announcement. In corporate news, steep discounts and higher costs drove ConAgra Foods Inc.’s fiscal first-quarter profit lower. Shares of the company, which owns the Chef Boyardee and Peter Pan foods brands, fell 80 cents, or 3.6 percent, to $21.57. Cruise line operator Carnival Corp. reported a 22 percent jump in quarterly profits as demand was strong during the summer. It also raised its full-year earnings outlook well above analysts’ forecasts. Shares rose 51 cents to $37.57. KUALA LUMPUR: World-renowned economics professor, Dr Nouriel Roubini, sent out warnings of a “high probability of another recession in the United States” and that the global economy could suffer a “couple of financial crises over the next 10 years”. Roubini, who is Professor of Economics & International Business at the Stern School of Business, New York University, also said that China, the world’s fastest-growing major economy, may face “greater headwinds should there be weak growth in the United States and Europe”. Roubini said even if the world economy didn’t slip into a double-dip, the effects would still be felt. He added that austerity measures to cut debt in advanced nations were hurting consumer and business confidence, and households in some of the largest economies were holding back spending. “Emerging economies may have to get used to relying on domestic demand in a period of subdued growth for developed countries,” Roubini said. He also said that while emerging economies could expect their recovery to be more sustainable, there was a danger of asset bubbles. “All this slosh of liquidity is going to be chasing assets and a lot of that liquidity is going to go from advanced economies in the form of dollar funded or yen-funded carry trades,” he said. He added that the challenge for emerging economies was to manage that inflow of hot money over the next few years. “Emerging economies should allow currencies to gradually appreciate, impose capital controls on hot money and supervise the financial system to control excessive credit growth,” he said. Roubini believes that current financial reforms discussed in the United States and around the world are not enough and will not prevent additional crises. He said nothing had changed, calling US reforms “too little, too late”. “We know the second half of the year is going to be worse than the first half of the year because of the tailwinds to growth from the fiscal stimulus” turning into austerity, he said. “The main scenario is an anemic recovery, but I don’t rule out that a double-dip will occur” in the United States, he said. An American jobless rate hovering near 10% is shaking consumer confidence and limiting spending, the biggest part of the economy. US policy makers said recently that growth in the country was likely to be modest in the near term. US expanded at a 1.6% annual rate, the Commerce Department said last month. A US growth rate of 1% would feel like a recession, Roubini said. “The banks in the US are already sitting on US$1 trillion in excess of reserves, (yet) they are not lending. The problems of the economy are problems of solvency, of credit, of houses, of corporates, of banks and not a problem of liquidity. I don’t believe quantitative easing is going to make much of a difference. Roubini believes the Obama administration needs to tackle the country’s high unemployment head-on, and suggests that the Obama administration adopt payroll tax cuts for a couple of years. “That’s a fiscal cost but where I suggest to make it revenue neutral is to make sure that the expiring tax cuts for the rich are going to be used,” he said. On the ongoing dispute between the United States and China over the yuan exchange rate, Roubini disagreed with Chinese Premier Wen Jiabao’s view that a 20% appreciation will bankrupt many companies in its export sector. “(China is a) country that has productivity growth and excess of wage growth – (it) can afford an appreciating currency without the negative effects on economic growth,” he said. NEW YORK: Americans in both the living room and the boardroom are growing more fearful about the economy, creating a Catch-22 for the job market: Shoppers won’t spend until they feel more secure, and business won’t hire until people start spending. The eroding views were revealed Tuesday by two separate surveys, one that found everyday Americans are increasingly pessimistic about jobs and another that found CEOs have grimmer predictions about upcoming sales. The monthly consumer confidence index from the Conference Board, a private research group, fell to 48.5 in September, its lowest point since February and down from 53.2 in August. Economists surveyed by Thomson Reuters were expecting 52.5 for September. It takes a reading of 90 to indicate a healthy economy — a level not approached since the recession began in December 2007. Meanwhile, a poll by Business Roundtable, an association of CEOs of big companies, found two-thirds of chief executives expected sales to grow over the next six months. That’s down from 79 percent in June. Causing uncertainty for both groups, Vitner says, are the Nov. 2 elections, when voters worried about increasing deficits and the economy’s slow recovery will decide whether to keep Democrats in power in Congress. The Federal Reserve’s efforts to pump up the economy and lower the unemployment rate, stuck at almost 10 percent, have fallen short. Fed chief Ben Bernanke has signaled that the Fed is prepared to take new action if things get worse, but there’s no easy solution. Some companies that had big rounds of layoffs during the worst of the recession, such as drugmaker Bristol-Myers Squibb Co., are still trimming work forces to bring down costs. The CEO survey suggests companies will be wary about adding workers into 2011. Only 31 percent of CEOs said they expected to increase their payrolls in the next six months, down from 39 percent in June, which was the best reading since before the recession. The recession is technically over — a panel of economists declared this month that it lasted 18 months and came to an end in July 2009 — but Americans are just as downbeat as they were a year ago. While unemployment is the biggest factor in depressing Americans’ moods, they’re also dealing with tight credit and depressed home values. Home prices ticked up in July for the fourth straight month, helped by the now-expired home credits, but many cities are bracing for declines in the year ahead, according to the Standard & Poor’s/Case-Shiller 20-city home price index. The declining confidence came as stocks staged a rally in September, putting the Dow Jones industrial average ahead for 2010. Tuesday’s report made investors jittery, but major indexes broke even as traders were encouraged by a flurry of corporate deals. What now for US economy? WASHINGTON: Republicans’ big gains in Congress will test the Wall Street adage that political gridlock is good. Putting more power in the hands of Republican politicians who campaigned on a smaller government platform means Congress is less likely to offer a hand should the economy stumble again. Republicans will win enough seats to take control of the House of Representatives, networks projected, and made big Senate gains on Tuesday. That leaves the US Federal Reserve as the primary source of support, suggesting ultra-low interest rates are here for quite a while, and the central bank will probably launch another round of money printing to try to rev up the recovery. Will the economy get a post-election bump? Probably not. Consumer spending, the primary growth engine, has been solid but is not expected to pick up much more until the job and housing markets improve. A Republican-heavy Congress will not be in a hurry to ramp up government spending after last year’s stimulus money runs out. State and local governments are strapped for cash, which blunts another potential source of growth. Business investment was extraordinarily strong earlier this year but has begun to taper off. More than 25 million people are either unemployed, underemployed or so discouraged that they have given up looking for work. Some analysts argue that the end of election season removes one source of uncertainty and could encourage companies to step up hiring. However, there are plenty of reasons remaining for businesses to feel unsettled. The list of worries includes the risk of another housing downturn, a global trade war, or a recurrence of Europe’s sovereign debt troubles. With corporate profits fading, hiring prospects still look modest. Will Wall Street like it? Maybe not as much as usual. Markets rallied on Tuesday in part because investors hoped big Republican wins would usher in a more business-friendly government. The gridlock-is-good theory picked up adherents in 1994 when President Bill Clinton’s Democrats suffered big congressional losses, forcing the two parties to compromise. The worry this time is that Congress will not be willing to act quickly should the economy falter. Investors have not forgotten how violently markets reacted in 2008 when Congress initially rejected a bank bailout bill. Where does this leave the Fed? Lonely. The Fed cut its benchmark interest rate to near zero in December 2008, and has nearly tripled its balance sheet to US$2.3 trillion to try to ward off another Great Depression. It is widely expected to announce another asset-buying programme at the conclusion of its policy-setting meeting yesterday. The economy has looked shaky as the fiscal stimulus wears off. If it weakens further, the Fed’s options are limited. Many economists worry that printing money won’t do much to drive growth because interest rates are already low and big companies are flush with cash and don’t need to borrow. NEW YORK: Three top Federal Reserve officials on Monday voiced concerns about the central bank’s latest efforts to boost the economy, with one warning the Fed’s bond buying might need to be curbed to head-off inflation. The remarks from Fed governor Kevin Warsh, Dallas Fed chief Richard Fisher and Thomas Hoenig of the Kansas City Fed underscored the unease within the central bank about the decision to buy an additional US$600bil in government debt. Last week’s decision has sparked an unusually vocal public debate among Fed officials and drawn the ire of many countries that say the United States is deliberately pushing down the dollar. Warsh raised the prospect that rising inflation risks could prompt the central bank to scale back the programme even with unemployment still painfully high. “Policies should be altered if certain objectives are satisfied, purported benefits disappoint, or potential risks threaten to materialise,” Warsh said. “We haven’t bought ourselves an eight-month holiday. We bought ourselves eight months of hard work,” he said. St. Louis Fed president James Bullard also stressed that the programme could be adjusted up or down as the economic outlook develops. For Bullard, the benefits of the unconventional bond-buying programme currently outweighed the risks, and he said it should prove as effective as traditional policy in spurring growth. Fisher said that for the programme to work, lawmakers must address the fiscal and regulatory uncertainties that he said were holding back businesses from expanding. “I would suggest that even if you share my cautious perspective on this matter, you might be assuaged by looking at this new initiative as a bridge loan to fiscal sanity,” he told a meeting of financial professionals in San Antonio. Bullard said he would have preferred if the Fed had not announced the US$600bil number upfront, but rather taken a more incremental approach. “The problem is such a number can take on a life of its own,” he said. Many economists think the Fed could eventually decide to push beyond the US$600bil in purchases announced last week, notwithstanding differing views within the central bank. The Fed’s decision to buy more debt, over and above the US$1.7 trillion in government and mortgage-related debt it has already bought, has drawn scathing comments from countries that see the United States pushing for an export edge. In response to an audience question about complaints by countries such as China and Germany about the Fed’s decision, Bullard said the US central bank must act to fulfill its mandate of price stability and maximum employment. “You can’t have other people around the world calling the shots on that mandate,” he said. Warsh, however, said heightened tensions in currency and capital markets raised the risk of a more difficult and protracted global economic recovery. He said these long-term risks needed to be taken into account. The Fed is already facing criticism from the political front. Tea Party favourite and 2008 Republican vice presidential nominee Sarah Palin on Monday suggested Fed chairman Ben Bernanke “cease and desist” with his plan to buy more government debt. “We shouldn’t be playing around with inflation,” she said. NEW YORK: Federal Reserve Chairman Ben Bernanke’s plan to rejuvenate the economy by having the Fed buy US$600 billion in Treasury bonds is coming under renewed attack — this time from fellow Republican economists. They argue that pumping many more dollars into the economy could eventually trigger inflation and weaken the dollar too much. The economists are making their case in a letter to Bernanke and in ads to run this week in the Wall Street Journal and the New York Times. The Treasury bond purchases “risk currency debasement and inflation, and we do not think they will achieve the Fed’s objective of promoting employment,” the economists wrote in their letter. At the same time, their criticism risks pushing the Fed closer into Washington politics, where many fear the central bank’s independence could be compromised. The economists express doubts that the program will help the Fed achieve a primary goal: reducing unemployment, now stuck at a high 9.6 percent rate. And they think it will inject new risks into the global economy. Bernanke, a Republican who was President George W. Bush’s top economist before taking over the Fed in 2006, has signaled frustration over the still-sluggish economy and persistently high unemployment. Even though the recession has ended, the unemployment rate has been stuck at 9.5 percent or higher for more than a year. In announcing the bond-purchase program Nov. 3, the Fed said it could lower long-term interest rates and stimulate stronger economic growth. Bernanke has said he thinks lower-interest loans would lead companies to borrow and expand. Cheaper mortgages would let more people buy or refinance. Higher stock prices would boost the wealth and confidence of individuals and businesses, he has suggested. And spending would rise, lifting incomes, profits and economic growth. But at a summit of world leaders in South Korea last week, China, Germany and other countries complained that the Fed’s plan would give U.S. exporters a competitive price edge by flooding world markets with dollars. The letter from the 23 economists represents a new front in the attack on the Fed’s bond-purchase plan. The economists who signed it include Douglas Holtz-Eakin, who served as a top policy adviser for 2008 Republican presidential candidate John McCain; John Taylor, a top Treasury Department official in the Bush administration; and Michael Boskin, chief economist to Bush’s father, President George H.W. Bush. The existence of the letter was reported earlier Monday by the Wall Street Journal. The Fed has said it will regularly review the program, under which the Treasury will buy $600 billion in bonds over the next eight months. The central bank left the door open to scaling back, or curtailing, the bond purchases if the economy performed better than expected — or buying more if the economy seriously weakened. Treasury prices fell and rates rose for a third day Monday after the letter to Bernanke came to light. The sell-off reflected speculation that the Fed might not carry out the full $600 billion bond-buying program as planned. The yield on the 10-year Treasury jumped to 2.93 percent. That’s its highest level since July, before the Fed began hinting it would take action to spur the economy. Bernanke insists the Fed has the tools to safely soak up all the extra money pumped into the economy and to avoid unleashing any worrisome inflation. Yet even within the Fed, some members have expressed uneasiness about the potential risks of the program and doubts about how much it will help the economy. Kevin Warsh, who was among 10 Fed officials who voted for the $600 billion program, last week nevertheless expressed doubts about whether it would boost the economy. And he warned of “significant risks,” including the potential for triggering excessive inflation later on. Warsh said the Fed might have to reconsider its program if the dollar continued to fall or if commodity prices continued to rise, raising inflation across the economy. Critics inside and outside the Fed also worry that the latest intervention opens the central bank to criticism that it is printing money to pay for the government’s debt. And, that, in turn, tarnishes the Fed’s independence. Rep. Mike Pence, R-Ind., a critic of the Fed’s bond-buying program, says he plans to introduce a bill that would change the Fed’s mission to focus solely on keeping inflation in check. Currently, the Fed has a “dual mandate” from Congress: to keep both inflation and unemployment low. Pence said he worries that, among other things, the Fed’s program would lead to a dangerous spurt of inflation. WASHINGTON: Federal Reserve Chairman Ben Bernanke is seeking to defuse rising criticism of the Fed’s $600 billion bond-purchase plan by arguing that it’s needed to bolster the economy and reduce unemployment. But he warns the Fed’s program can’t succeed on its own. In his first speech since the Fed announced the bond-buying program on Nov. 3, the Fed chief made his most forceful case to date that Congress also must provide more stimulus aid. Without more stimulus, high unemployment could persist for years, he said. But in making that argument, Bernanke risks heightening complaints that he’s plunging the Fed into partisan politics. He also said the global economy could falter if struggling countries abroad don’t receive sufficient support. Bernanke made the remarks in a speech prepared for delivery to a banking conference Friday in Frankfurt, Germany. A copy of his speech was made available Thursday night. The goal of the Fed’s program is to invigorate the economy in part by lifting stock prices and encouraging Americans to spend more. Lower interest rates on loans would prompt companies to borrow and expand. Cheaper mortgages would let more people buy or refinance homes. Higher stock prices would boost the wealth and confidence of individuals and businesses, Bernanke has suggested. And the additional spending would lift incomes, profits and economic growth. But the Fed’s program has triggered a barrage of criticism both within the United States and abroad. Critics at home, including Republican leaders in Congress and some Fed officials, question how much help the program will give the economy. They also worry that it could do harm – unleashing inflation and leading to speculative buying on Wall Street. And, at a summit of world leaders in South Korea last week, China, Germany, Brazil and other countries complained that the Fed’s plan would give U.S. exporters a competitive price edge by flooding world markets with dollars. A weaker dollar makes U.S. goods more attractive to foreign buyers. Because countries are recovering from the severe global recession at different speeds, tensions among nations have risen, making it more difficult to find global solutions to global problems, Bernanke said. So-called emerging countries like China, Brazil and India are growing at much faster rates than “advanced” economies like the United States, Japan and Britain. “Insufficiently supportive policies” in the United States and other advanced economies could “undermine the recovery not only in those economies but for the world as a whole,” Bernanke warned. In contrast, China and other emerging economies face the challenge of keeping growth robust, without igniting inflation, cases that may involve withdrawing stimulative measures, he said. By keeping their currencies artificially weak, China and other emerging economies are causing problems for themselves and for the stability of the world economy as a whole, Bernanke said. Bernanke made the case that the Fed’s action was needed to support the economy, promote a faster pace of job creation and reduce the risk that very low inflation could turn into deflation, a prolonged and destabilizing drop in prices of goods and services, in wages and in the values of stocks and homes. Even so, the Fed’s program by itself can’t fix all the economy’s problems, Bernanke said. “There are limits to what can be achieved by the central bank alone,” he said, tamping down expectations. “A fiscal program that combines near-term measures to enhance growth with strong confidence-inducing steps to reduce longer-term structural (budget) deficits would be an important complement to the policies of the Federal Reserve,” he said. But the Fed chief amplified that warning. He is doing so as Republicans in Congress – coming off big wins from the midterm elections – are using their clout to push for less government spending and more fiscal discipline. Republicans are upset with Bernanke because they think the Fed is overstepping its bounds with the bond-buying program. They argue that the Fed is printing money to pay for the government’s massive debt. Republican Rep. Mike Pence and Sen. Bob Corker want the Fed’s mission to be revamped. They want the Fed to focus solely on keeping inflation in check. It now has a “dual mandate” from Congress: to keep both inflation and unemployment low. On the defensive, Bernanke was forced earlier this week to meet privately with lawmakers on the Senate Banking Committee to defend the Fed’s program. A stream of Bernanke’s colleagues have also been out making public appearances backing the Fed’s action in recent days. Narayana Kocherlakota, president of the Federal Reserve Bank of Minneapolis, and Sandra Pianalto, president of the Cleveland Fed, were on the circuit Thursday. WASHINGTON: Federal Reserve officials have become more pessimistic in their economic outlook through next year and have lowered their forecast for growth. The U.S. economy will grow only 2.4 percent to 2.5 percent this year, Fed officials said Tuesday in an updated forecast. That’s down sharply from a previous projection of 3 percent to 3.5 percent. Next year, the economy will expand by 3 percent to 3.6 percent, the Fed said, also much lower than its June forecast. Fed officials project that unemployment won’t change much this year, averaging between 9.5 percent and 9.7 percent. The current unemployment rate is 9.6 percent. Progress in reducing unemployment has been “disappointingly slow,” the central bank said, according to the minutes of its Nov. 2-3 meeting. The darker view helps explain why the Fed decided at its meeting earlier this month to launch another round of stimulus. The central bank plans to buy $600 billion in Treasury bonds over the next eight months in an effort to lower interest rates and spur more spending. The Fed is slightly more optimistic about 2012, in part because officials expect the bond-buying program to have a positive impact. The economy should grow 3.6 percent to 4.5 percent that year, a tick better than June’s forecast of 3.5 percent to 4.5 percent. The economy will also grow 3.5 percent to 4.6 percent in 2013, the central bank said, the first time it has issued projections for that year. The jobless rate will be 8.9 percent to 9.1 percent in 2011, Fed officials predict. That’s much worse than June’s projection of 8.3 percent to 8.7 percent. By 2012, when President Barack Obama faces the electorate, unemployment will be 7.7 percent to 8.2 percent, up from the previous forecast of 7.1 percent to 7.5 percent. The Fed’s forecasts of a slow economy with only gradual improvement in the job market are broadly similar to those by private economists. An Associated Press survey of 43 leading economists last month found that they expect the economy to expand just 2.7 percent in 2011, after growing only 2.6 percent this year. The unemployment rate will remain at 9 percent by the end of 2011, the economists said. The Fed said that data released since its last projections showed the economy was weaker in the first half of this year than it previously thought. The economy grew at only a 1.7 percent annual pace in the April-June period, much lower than the first quarter’s 3.7 percent rate. The central bank expects prices will remain in check. Inflation is projected to rise 1.1 percent to 1.7 percent in 2011, little changed from the previous forecast of 1.1 percent to 1.6 percent.